This funky large tea cup featuring a pretty cupcake design is the perfect gift for the yummy Mummy in your life who loves to drink tea!! 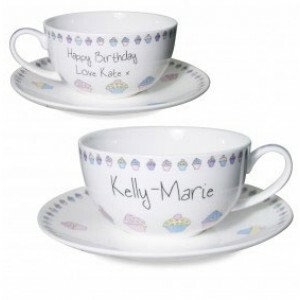 Personalise with a name on the front, upto 12 characters. Add a message on the back, 2 lines of maximum 15 characters each line including spaces. Please enter these details into the text box below. Please allow 4-5 working days (UK ONLY) from placing your order for delivery of your personalised gift.